The chauffeur fracture is also called a lorrie or Hutchinson fracture. 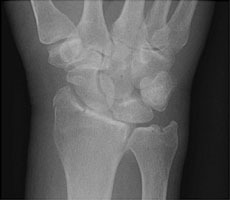 This fracture results from a direct injury to the thenar side of the wrist, resulting in intraarticular fracture at the base of the radial styloid. This type of fracture resulted from a backfire when a crank was used to start a motor in automobiles. 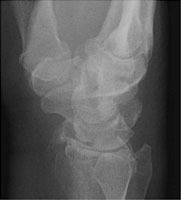 A PA radiograph of the wrist. There is an intraarticular fracture of the radial styloid. B Lateral radiograph of the wrist. This shows the radial styloid fracture. 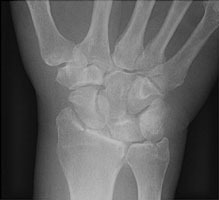 C PA radiograph of the wrist with scaphoid deviation. This also demonstrates the intraarticular involvement of this fracture.